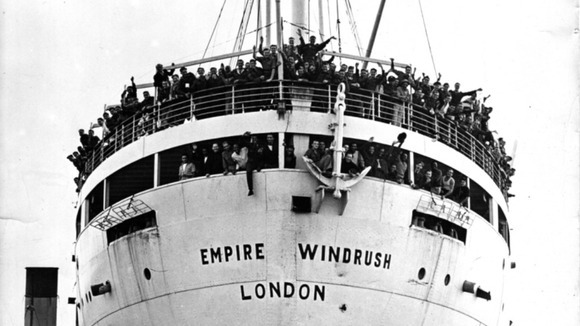 It’s 65 years tomorrow since the Empire Windrush arrived at Tilbury Docks, carrying 493 passengers from Jamaica wishing to start a new life in the UK.The 492 passengers came from Jamaica, Trinidad and Tobago and other Caribbean islands–as ITV reports. They all paid the £28 10s fare to travel 8000 miles in the hope that there would be work at the end of the journey. Many were veterans who fought for Britain in the Second World War and came to the ‘Mother Country’ to re-join the RAF. More than 10,000 West Indians volunteered to fight in the war, in fact the RAF got more recruits from the Caribbean than any other part of the Empire. Around 400 worked as air crew and 6,000 as ground staff. Among the employers of these first West African immigrants were the new National Health Service and London Transport. The Caribbeans found themselves excluded from many social activities in London but began to create their own opportunities; setting up churches and establishing a co-operative method of saving called the pardner’ system. As they caught their first glimpse of Tilbury Docks, they couldn’t have envisaged how important their journey was to be for the social and cultural fabric of London and the whole of the UK.